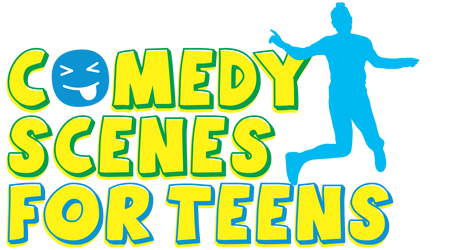 Hilarious comic twists on the anxieties of being a teen: kissing, dating, crushes, gossip, talent shows, narcissism, sibling rivalry, etc. Includes: 1. Picture Perfect Love - Boy sees his photo in a girl’s notebook. 2. Stupid Looks - Boy lacks fashion. 3. Kissing Contest - Boy signs up unsuspecting girl. 4. Rumors - Gossips hear lies about themselves. 5. The Talk - Boy anticipates Dad’s words. 6. The Cutest Boy - Girl plays matchmaker. 7. Zero Talent - Airheads can’t compete. 8. Bad Timing - Boy hesitating to ask out girl. 9. Big Trouble - Siblings tattle on each other. 10. Guess What’s for Lunch - Girls gross out in cafeteria. Sketches may be used together or separately.